Be the first to share your favorite memory, photo or story of Mary Louise. This memorial page is dedicated for family, friends and future generations to celebrate the life of their loved one. 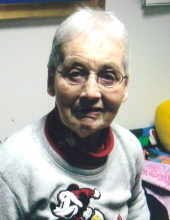 Mary “Mary Lou” Louis Naumann, 88, of Clear Lake, passed away Wednesday, March 27, 2019 at the Muse Norris Hospice Inpatient Unit in Mason City. Mary Louise Naumann, the daughter of George Andrew and Rose Marie (Scheu) Naumann, was born April 8, 1930 in Floyd County, Iowa. She stayed at home with her mother, her father died when she was six, until her mother’s death in 1985 when she became a resident at Opportunity Village in Clear Lake. Mary Lou remained at Opportunity Village until 2007 when she moved to the Oakwood Care Center in Clear Lake. Mary Lou liked to live her life independently and enjoyed spending time with her favorite friend, Shawn Frerichs. She cherished going for rides on her three wheeled bicycle, collecting anything pertaining to Mickey Mouse, the color purple and she was very proud of her gold medals from the Special Olympics. Mary Lou loved her family and would often reminisce with them and look at many photos. She was active in her Catholic faith, attending Mass even in the last few weeks of her life. Living family members include several nieces and nephews. Mary Lou was preceded in death by her parents; siblings: George Joseph Naumann, Sr., Bernard Nick Naumann, Rose Marie Marzen, Leo Maurie Naumann, Agnes JoAnn Whitmore and Ruth Magdalein Cook. To send flowers or a remembrance gift to the family of Mary Louise "Mary Lou" Naumann, please visit our Tribute Store. "Email Address" would like to share the life celebration of Mary Louise "Mary Lou" Naumann. Click on the "link" to go to share a favorite memory or leave a condolence message for the family.